UKE-HUNT is ME FIRST AND THE GIMME GIMMES vocalist Spike Slawsons latest cover band extravaganza.What started as Spike simply learning and arranging some of his favorite classic songs for the ukuleleon his own, eventually evolved into added musicians and a layered patchwork of ukulele, saxophone, glockenspiel,stylophone, organ, standup bass, and all manner of percussive elements. Obviously, due in no smallpart to the instrumentation, this most recent foray into the world of breathing new life into shopworn classicsdisplays a decidedly different slant than the breakneck tempo of the GIMMES. 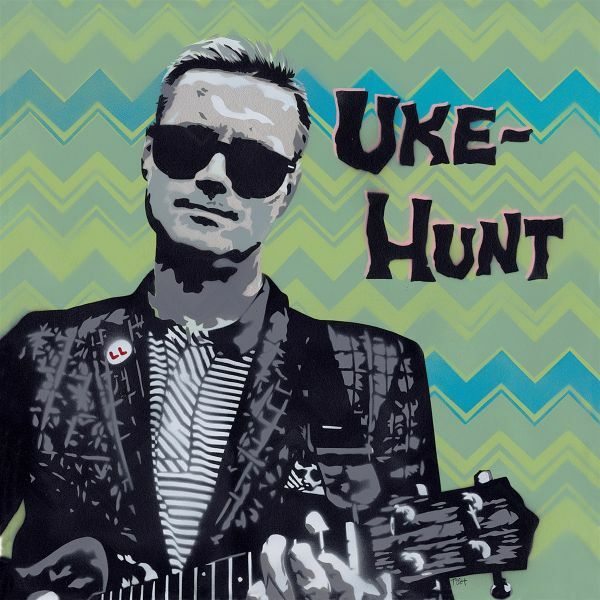 UKE-HUNT slips into somethinga little more comfortable with a lounge/soul vibe thatd be at home in a tiki bar, Elks lodge, rock club, oron a sunny patio. Spike uses UKE-HUNT as a vehicle to explore a diverse selection of songs and while sometracks seem to be made for UKE-HUNT, others undergo some astonishing genre-bending to arrive in perfectharmony with the rest of the album. Of course, the centerpiece of the entire UKE-HUNT experience is Spikesenchanting vocal ability, which is on full display in all of its silky splendor from start to finish. So pour yourselfa cocktail and set course for the captivating sounds of UKE-HUNT.